In this Boston Herald file photo, a perturbed, sleep-deprived John Lackey storms off the mound and can be clearly seen verbally berating a ball girl. 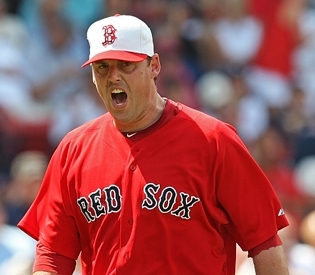 The frustration in John Lackey’s beet-red face was all too visible during his first start of the homestand. In the first inning, a foul ball caromed off the padding on the wall that juts out at the corner of the left-field box seats, landing 30 feet in front of Josh Reddick. Twenty-five seconds later, Reddick had finally retrieved the ball and returned to his position. In the third, a twisting liner short-hopped the cement bottom of the wall near the camera well on the first-base line, rolling right past a 16-year-old local varsity softball star and settling into no-man’s land in shallow right-center. Forty seconds later, play resumed and Lackey was finally allowed to throw his next pitch. Certainly, some of the more surehanded, veteran ball boys and girls around the majors may have scooped up the same chances with relative ease, sparing Lackey the disruptions. But these are the hazards of employing high school youths from the Greater Boston area to man the scarce foul territory that horseshoes around the baseball diamond inside Fenway Park. Normally a pillar of stoicism on the mound, Lackey is finding it increasingly difficult to ignore the deficiencies of the ball girls and boys stationed down the left-field and right-field foul lines at Fenway Park. Earlier this week, the pitcher finally broke his silence. “I’m not trying to show anyone up, but I mean, c’mon. These kids are pretty much just waving at these balls as they carom off the padding of the walls into the outfield,” he told reporters during batting practice earlier this week. Baseball scouts agree that foul ball caroms in Fenway are a significant problem – particularly when Lackey is on the hill. Opponents have routinely been peppering both fair territory and foul ground with loud, ringing hits off the righthander for the better part of his Red Sox tenure. Lackey, however, refuses to let the team-chosen ball girls and boys off the hook. The pitcher was understandably not interested in acknowledging the small sample size or doling out any leniency based on gender. Club officials balked at the idea of making a trade before the July 31 deadline to fill the holes Lackey speaks of with such rabid disdain. Is this guy human. It’s hard for the girls to catch a ball in the bleachers.